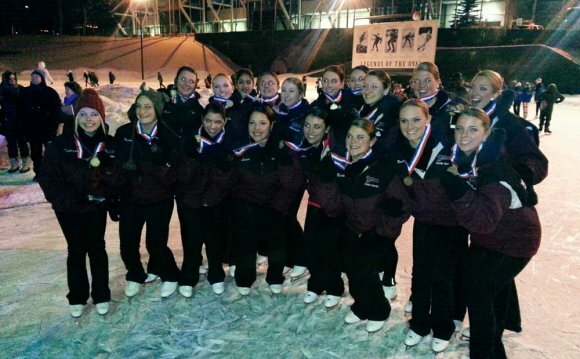 The Shadows of the Southern Connecticut Skating team (SCSS) brought home the silver medal from the Eastern Synchronized Skating Sectional Championships in Richmond, Virginia recently. This qualifying event hosted over 160 teams from the East Coast for three days of competition. The Shadows won second place of 28 Open Juvenile level teams. After their first skate on Thursday night, they placed third of nine teams in the qualifying round. As expected, the championship round was more competitive with 12 finalists. First place winner was Central Park Ice of N.Y. The SSCS Shadows’ silver winning performance to “A Brand New Day” from The Wiz, demonstrated precision skating, speed, and artistry, as well as incorporated many required synchro skating elements such as: Lines, Blocks, Circles, Intersections, Moves in the Fields, Moves in Isolation, Spins, and Wheels. Continuing the momentum from the season’s earlier medals, this championship win brings the Shadows medal count to: 1 Gold (CT Terry Conners Open), 2 Silver (MA Colonials and VA Eastern Championship), and 1 Bronze (Eastern Championship qualifier). It is particularly bittersweet for four of the 14 Shadows who graduate this year: Emilly Hernandez, Klara Hoherchak, Emily Merole, and Sami Scordo. Klara Hoherchak, a senior at Stamford High School and a SCSS skater for 10 years said, “It’s kinds of crazy to think about how long us four seniors have been skating together and with the same amazing coaches. On the first day of the event, the Greater Richmond Convention Center had trouble making ice, which resulted in a scramble of all teams to find practice ice at other area rinks. “Our unpredictable start to the weekend made our silver medal performance even more worthwhile.” said Emily Merole, a senior at Holy Trinity Catholic. “Our team’s hard work and dedication paid off today. It helps that we all truly get along and work well together, ” Emilly Hernandez, a senior and Stamford resident added. “These girls are my family, and I wouldn’t have wanted to spend my last sectionals with anyone else!” said Merole. While winning is always an objective, the SCSS team’s coaches and parents are consistent with a balanced approach to dedication, keeping it fun, positive, and friendly. The SCSS Shadows, Shimmers, and Sprites have 44 skaters residing in: Stamford, Greenwich, Westport, Darien, New Canaan, Norwalk; and White Plains, NY. Follow their season as their next competition takes them to Hershey PA for the Reflections Invitational, Feb. 14-15.